Account managers are the "key people who can translate our business" to their creative colleagues, Paul Pomroy, chief executive of McDonald's UK, told an industry audience at the Oystercatchers club. "Sometimes we’re very quick to criticise structures," Pomroy said, a week after Procter & Gamble chief brand officer Marc Pritchard told the ISBA conference that there were too many account managers in agencies. In an interview with Campaign, Pritchard said he would like creatives to make up around three quarters of agency headcounts. Pomroy added that being transparent with agencies partners was crucial for allowing relationships to function – part of the reason why McDonald’s invites agencies, along with other suppliers, to attend its annual general meeting. "If we’re not open with them they can't do their job either," he said. "Part of the transparency of allowing people to come to our AGM is they can see what we’re trying to achieve over an 18-month period. "The worst thing for any account is to be told you’ve got a couple of weeks to turn around creative on a product that’s probably not right either." 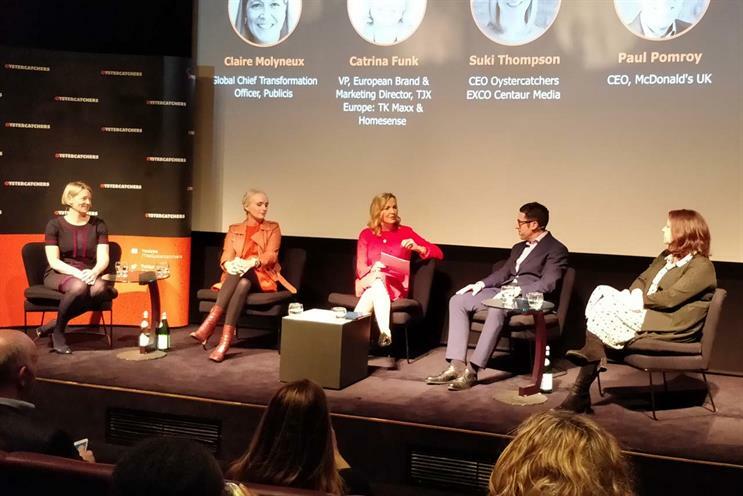 Pomroy was speaking alongside Louise Fowler, chief customer and marketing officer at the Post Office, Catrina Funk, vice-president, European brand and marketing director at TJX Europe (TK Maxx), and Claire Molyneux, chief transformation officer, Publicis Communications. Leading calls for marketers to up their game in the way they deal with agencies, Fowler said: "I’ve never worked with a bad agency, but I’ve worked with lots of bad clients. When you look at the brief and how you’ve managed them, it’s not the agency’s fault" when things don’t work out as desired. Brands also had to offer space for their agencies to be bold, even if that meant variable results, Funk said. "Last year we had this great idea to make a ‘Baby oracle’ bot – a chubby talking baby," she said, describing a 2016 Facebook Messenger chatbot created by Wieden & Kennedy. "It was quite bold, outrageous and fun. Once users got into the digital it really worked and was quite engaging – but not many got in. "If we hadn't had that experience, though, I don’t think we’d have been as brave this year, because we’d already been on that journey. Talking risks, learning from it, having a culture where it’s ok to be bold." Funk also described a mantra adopted by TK Maxx: "Be more swan". This, she said, was an "aspiration on how to show up and be a a great agency or client. Showing up gorgeous, outrageous, calm. Being bold and fresh." Molyneux has led efforts to transform the way different elements of the Publicis Groupe work together, through the company's "power of one" model - which a number of clients, including P&G and Daimler, have opted into. But she added that clients were "not really interested in how we organise ourselves" when it came to agency silos, rather that "what they’re really interested in is the business outcomes" and seamless collaboration.